picus woodwrights » The Aaron Peck House, ca. 1785, North Kingstown, RI. The Aaron Peck house is in the heart of Wickford Village in North Kingstown and dates to the late eighteenth century. The original structure was a modest storey and a half gambrel with later saltbox and contemporary kitchen additions. While the house had been worked on extensively over the years, it was built over a shallow, unventilated crawlspace and all previous work had overlooked addressing the decay that two hundred and thirty years of wet, stale air can have on the floor framing and house sills. When Picus Woodwrights was engaged, we could push against one side of the house and feel the walls move on the opposite side. 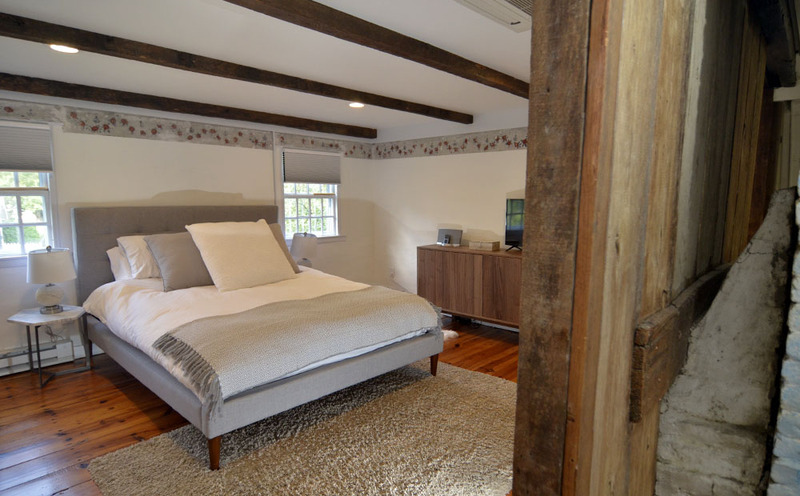 The homeowners reached out to us to design and build a master suite on the second floor that would provide modern amenities while remaining sensitive to the original features of the house. However, we all quickly realized that before we could take this part of the project on, the house would need significant structural work and the long-closed crawlspace would need to be opened. This gave us the opportunity to not only replace any failed framing and add a full foundation but to upgrade all of the utilities and add spray foam insulation, as well. We also restored the original single-hung windows and added discrete central air and heat to the first and second floors. Picus managed not only the project budget, design and construction but also the administrative oversight that comes with a project in need of extensive structural work located on the water and in a historic district. Ultimately, we restored or rebuilt most of the interior of the house and, in so doing, addressed both the needs of the client and the needs of the building. While in construction, we sometimes fondly and sometimes wryly referred to the house as a Faberge egg or a ship-in-a-bottle.